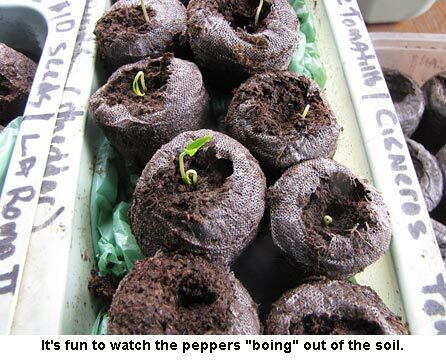 Our peppers are really popping up! 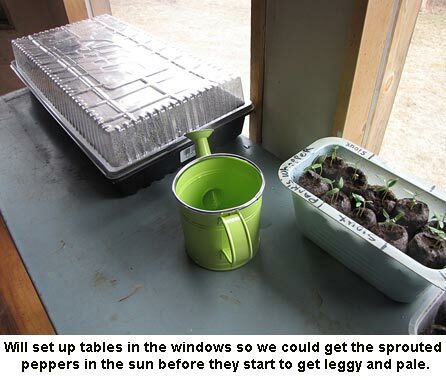 Today Will moved two tables into the living room windows so they can get plenty of sun until we get the other mini-greenhouse set up in a window. They are just leaping out of their peat pellets, despite waking up to snow falling this morning. We’ve had a busy week. Tuesday Will and I had to drive to Minneapolis for a doctor’s appointment for his back at the VA hospital. He was not looking forward to that as it’s a five-hour, one-way drive. And sitting for even an hour is the thing that gets his back the worst. But he came through it fine and came home bearing a Tens unit, the battery operated machine that sends electrical impulses to electrodes pasted to his back. It does seem to help a lot. Then we had to get up at 5 a.m. yesterday to get to the Hibbing hospital for my stress test at 7 a.m. Boy were we NOT ready to get up that early … again. But other than a nurse not being able to hit a vein in my arm (ouch, ouch, ouch!) it all went well. Tomorrow I visit my doctor and find out the results of all the tests; echo, X-ray, and stress test. I’m so hoping that my shortness of breath and chest pains are nothing to worry about. Thanks for all those prayers. See, they really DO work! I’m feeling better and Will is too. We’re improving daily. And you bet, some warm sun feels great too. Have been in prayer for you, Jackie and wondering how you are coming along? When I don’t see a post from you, as the dear homesteading friend that you are, I begin to fret and wish I could hear from you that you are okay. So, if you get a chance, let us all know as we care for YOU. I too am so looking forward to your next book, I sure enjoyed the first, couldn’t wait so I got it on kindle. and you sketch and paint too? wow multi-talented lady, plus all of you and Wills gardening skills, and Wills ability to fix anything. Talented couple. Hope your testing goes well and you get to feeling better! Will could benefit from a car seat pad with heat and massage. I have one by Homedics and use it for any long trips. It plugs into the cigarette lighter. I have a bad back and couldn’t make a long trip without mine! And SURE looking forward to the next book. #1 was fantastic. Offering many prayers for good results on your tests Jackie. Wishing you both good health. Please update us when you can. We all worry for you! We’ll also be planting our tomatoes this weekend. Can’t wait to get started. Spring is finally here. You’ll be in my thoughts tomorrow. FYI, I have a gadget like Will’s, only a cheaper, OTC version. Even with infrequent use, it has worked wonders for a slip/fall injury late last year. I hope he has similar results. 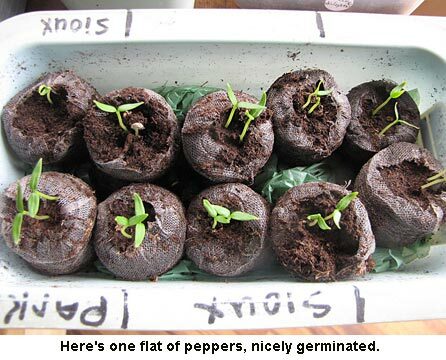 And thank you… the tomato seeds planted on Sunday have already germinated and popped up. Four days!! You are in my prayers, too. Maybe you just need a few weeks of good sunshine to get you going again, I hope! Praying for all to go well when you visit the doctor for the test results! You have so many good things going for you – seems like everything should be fine! Hope Will’s back is better – thank goodness the TENS machine is helping.